Saturday, October 22 at 2:00pm. The Zombmob will start arriving at 1pm to help keep the hoard together. Notes: Meet where the zombies are converging. You will be able to find them. 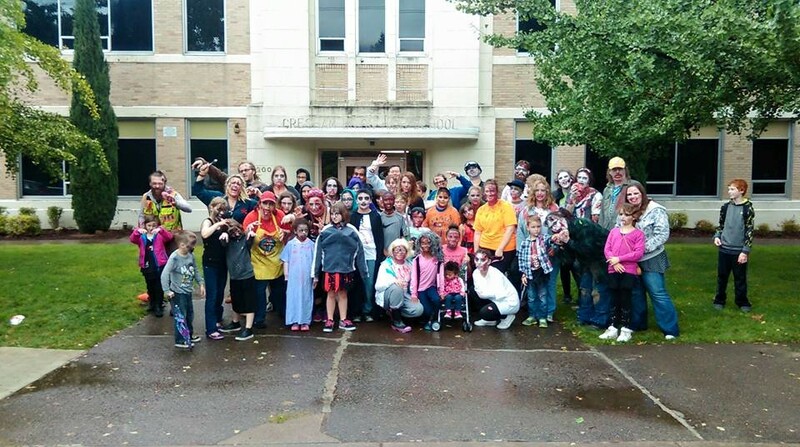 Gresham Zombie Walk is a free family friendly event that welcomes zombies of all shape, size, and special effects makeup skill set. This year, we are also accepting non perishable food to be distributed in our community. We leave Main City Park at 2pm sharp, so make sure to get there early enough to touch up your blood and take photos with the other zombies. We are a sidewalk event, so be sure to obey all traffic signals. Naill's Zombie Control Service is helping to keep us safe and moving. 1. This is a FREE family friendly event. 2. We are hosting a canned food drive, however you do not need to bring food to participate. 3. Keep your gore to yourself. It may seem funny to slap a bloody hand print on a window, but we will have a mandatory route cleanup if we start leaving our gore around. Our lovely downtown businesses will not want us to come back if we gross up the place. 4. Zombies are scary. Most people think they are fun, but we will be in public and if you see that someone is scared, shamble away nicely with a wave and a smile. 5. We will have help with traffic safety. Please obey the wonderful volunteers from Naill's Zombie Control Service. They are amazing and we love them. 6. We leave at 2pm sharp from Main City Park. Make sure to get there early enough to be ready to shamble. 7. We are not one of these new fangled running rage zombie hoards. Think Romero zombies and shamble accordingly. 8. We are not responsible for lost, stolen, or damaged zombies, cars, or children. Please use common sense and don't leave valuables in your vehicle, lock it up, and keep an eye on your little shamblers. 9. If any zombie hunters should show up, ignore them. If any press shows up, scowl for the camera. 10. Be rad. That's really all we ask.